Get peace of mind from premium leak control technology. FloLogic’s superior technology constantly identifies leaks of virtually all sizes when they begin and stops them automatically. Now that’s smart. Only FloLogic’s EverWatch™ flow-sensing technology continuously catches leaks beginning at 1/2 ounce-per-minute, anywhere in the plumbing supply. Even small leaks will cause major damage if undetected. Low cost leak detectors can’t identify small leaks.  FloLogic monitors in real time, 24/7, with a flow sensor that is more sensitive than most water meters. FloLogic is installed in the pipe where water enters the property.  FloLogic’s EverWatch™ technology constantly monitors every facet of the plumbing supply to catch virtually all leaks, from small pinhole-size to high flow leaks. Typical water use occurs in intervals. Leaks cause a continuous flow. They are automatically stopped as soon as flow times violate your Home or Away settings. You are notified immediately through the app. FloLogic detects a leak. The water supply is turned off. You are alerted. All of this automatically. After detecting a leak or critically low room temperature, the system closes the water supply to minimize and prevent any damage or waste. 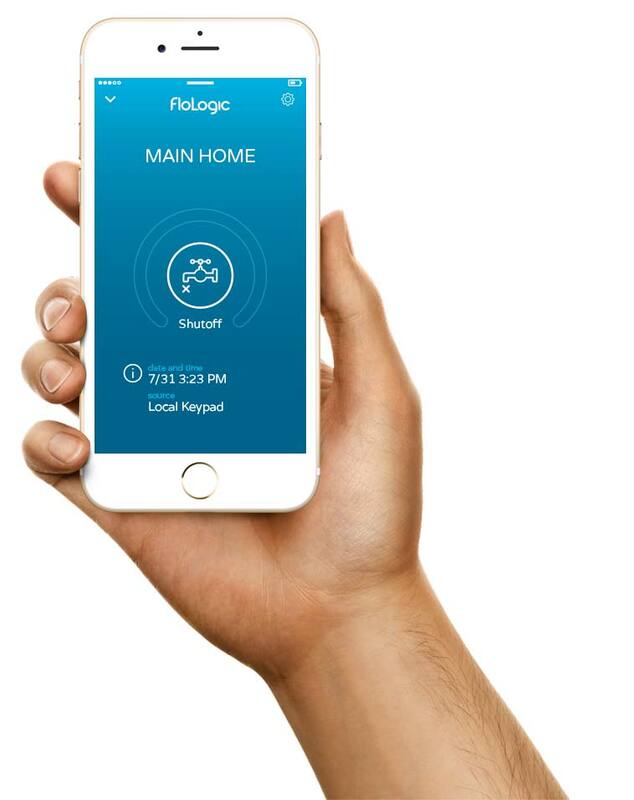 FloLogic keeps your home safe, wherever you may be. 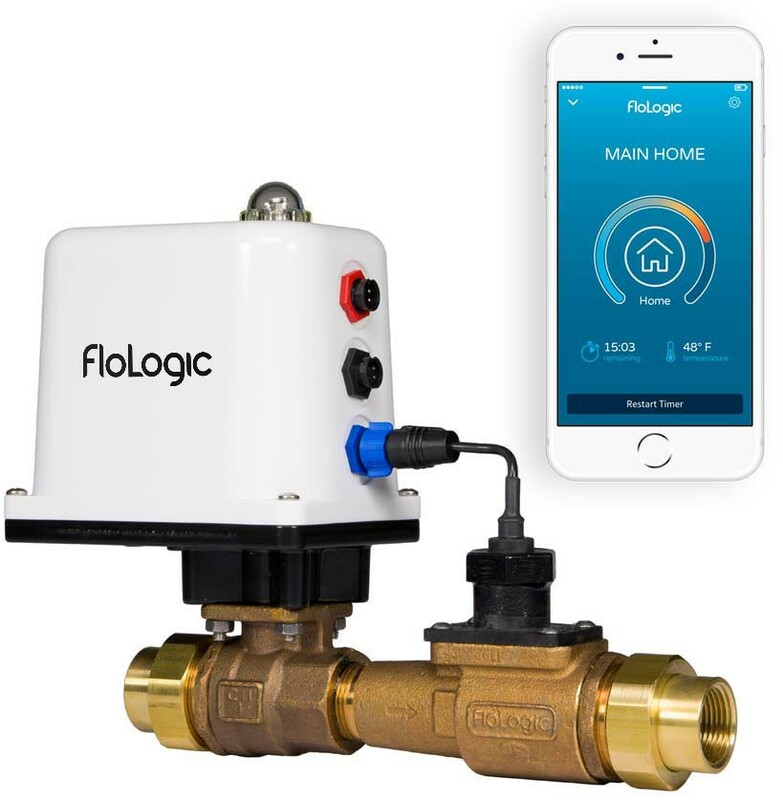 The FloLogic mobile app sends instant alerts, providing vital information about abnormal water activty, critcally low temperatures, or auto-shutoffs. You can easily forward information to a plumber, caretaker or your emergency contacts. With the tap of a smartphone, you can turn your water off and on, change the System mode, adjust the settings, see if water is flowing, identify the flow rate and more—whether you’re home or thousands of miles away. FloLogic has been revolutionizing leak control technology since 2000.  Today’s FloLogic System offers premium engineering and exclusive technology for property owners who demand superior plumbing system oversight. FloLogic is available in 1″ (50 GPM), 1.5″ (100 GPM) and 2″ (200 GPM) configurations. It features fully adjustable flow sensitivity and flowtime settings for maximum protection. 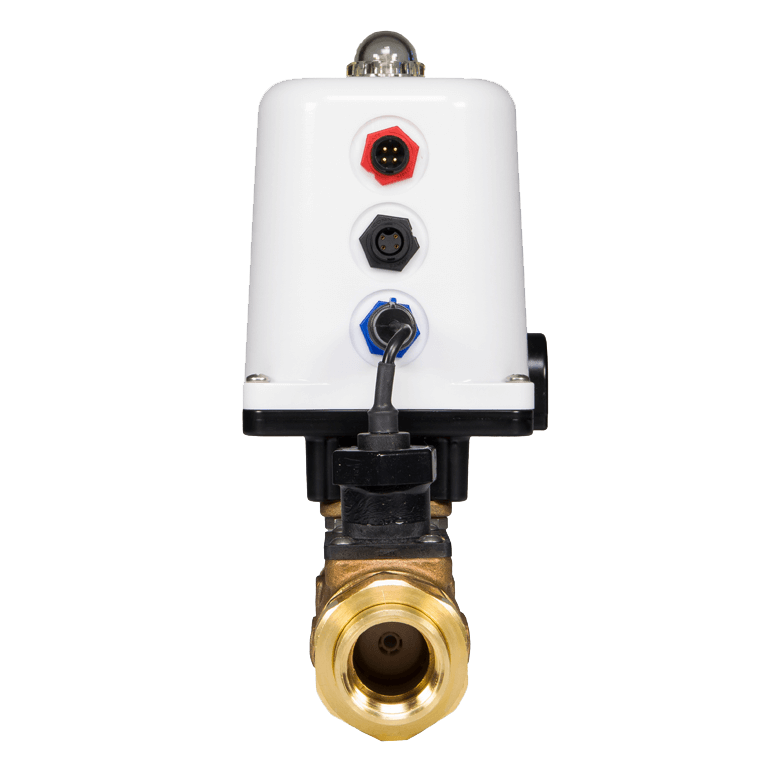 The waterproof valve assembly (IP68) allows for both indoor and outdoor installations. It can be installed vertically or horizontally in up or down orientations. And it has standard home security connections as well as irrigation, water softener and pool fill integrations to avoid false alarms. The patented valve auto exercise feature ensures the valve closes when called upon. FloLogic comes with a best-in-category standard five-year warranty. It features solid, lead-free, cast bronze construction with a full-port stainless steel ball—made in the USA. The FloLogic System is listed with UL, cUL, UPC, and cUPC. It is certified to NSF 61-8 with a pressure drop similar to one 90 degree pipe turn. FloLogic has an integrated manual override. And if AC power is interrupted, the system battery provides power for up to seven days. It’s time for a smart solution. Have a water leak problem? FloLogic can help you maintain insurance and ensure that water never destroys your property again. FloLogic will protect your home 24/7 and may qualify you for insurance premium discounts. Need to protect a client? FloLogic is the trusted brand for comprehensive leak control.